Leesburg, Virginia. Robert Nakamoto, known to all as “Bob,” passed away on Wednesday, April 23, 2013 at his home in Leesburg, Virginia, surrounded by his children and family members. Bob was President of JAVA from 2007-2010 and since that time as Chair of JAVA’s Finance Committee. He also served in the JAVA’s Speakers Bureau to publicize the Japanese American experience during WW II Bob was deeply involved in veterans and community activities nationwide supporting them with his time, executive expertise, and contributions. Bob was Chairman of Amour, LLC and Chairman of InterAmerica Global, both involved in international exports. 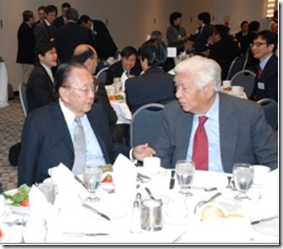 Prior to that, he was Chairman and principal owner of Base Technologies Inc., a 25 year old Information Technology company, headquartered in McLean, Virginia. He also had served as Director of Corporate System, MCI; Deputy Commissioner for Planning for the state of Texas; Director of Planning for Medicare and Medicaid Programs for the Federal Government; and manager of Data Processing for the State of California and Sacramento County. He served on Presidential Task Force for both parties. Born in California and graduated from California State University, he was a Veteran of the Korean War and the father of five children. During his lifetime, Bob received various awards, including the Government of Japan Foreign Minister’s Award in recognition of his efforts to enhance Japan-US relations; was conferred the title of Honorary Citizen of Texas; and, earlier this year, received JAVA’s Terry Shima Leadership Award. Bob will be interred at the National Arlington Cemetery at a later date. Memorial service will be held on May 14, 2014 at 11:00 AM at the River Creek Club, 43800 Olympic Blvd, Leesburg, Virginia. Bob’s family requests that, in lieu of flowers, donations may be made to the “Bob Nakamoto Scholarship Fund.” Please send your checks to JAVA Treasurer, Mark Nakagawa, 9455 Park Hunt Court, Springfield, VA 22153. On the check memorandum line please state “Bob Nakamoto Scholarship Fund.” Cards and letters to Bob’s family are being received at 43714 Moorland Court, Leesburg, VA 20176.